Call us at (780) 632-3912 to book your new patient consultation with us today! Dr. Nitin Goyal was raised in India and graduated with dental degree from a dental school in India. 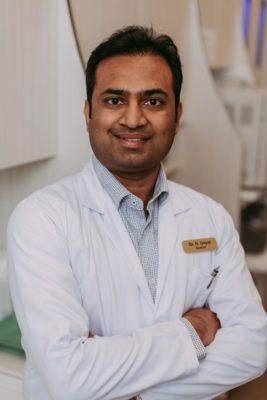 Dr. Goyal has furthered his education in Ontario and has been a practicing dentist in North Battleford, Saskatchewan before joining Vegreville Family Dental team. Dr. Goyal believes your experience with the dentist should be informative, relaxing and as stress-free as possible. with Dr. Nitin Goyal today! Disclaimer: Dr. Nitin Goyal is a Vegreville General Dentist. He is not a specialist in Cosmetic or Family Dentistry. Cosmetic and Family Dentistry are not specialties recognized by the Alberta Dental Association & College (ADA&C). Our general dentists provide cosmetic and family dental procedures such as porcelain veneers, dental crowns, dental braces, and teeth whitening as part of their General Dentistry license. As Vegreville Family Dentists, we provide General Dental procedures for all ages within the family.